NOTE: This mouthful of goodness comes from a dear lady, Madeline Richmond, who lives in Sandstone, West Virginia. The recipe was given to me from her family, who say, “Grandma Richmond” has made this cake for our family for 25 years.” I was so blessed to have received it, and I wanted to share it with all of you. Preheat oven to 350-degrees. Butter Bundt pan and dust with flour; set aside. In large bowl, stir together cake mix and vanilla pudding. Add the olive oil, water, eggs, butter extract and vanilla. Stir by hand just until ingredients are blended. Pour half the batter in pan. 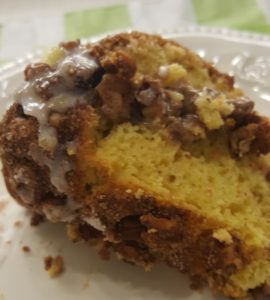 Make the filling by combining the sugar, walnuts, and cinnamon. On top of batter, add half of cinnamon sugar mixture and fold/swirl into cake batter. Add remainder batter and sprinkle the rest of the cinnamon sugar over top. Swirl in some of the sugar mixture, leaving the rest loose on top. Bake for 1 hour. Cake is done when it springs back with light touch to top. Remove from oven and let sit 5 minutes. Loosen cake by running a knife around side of pan. Gently invert onto a pretty cake platter; let cool to slightly warm. 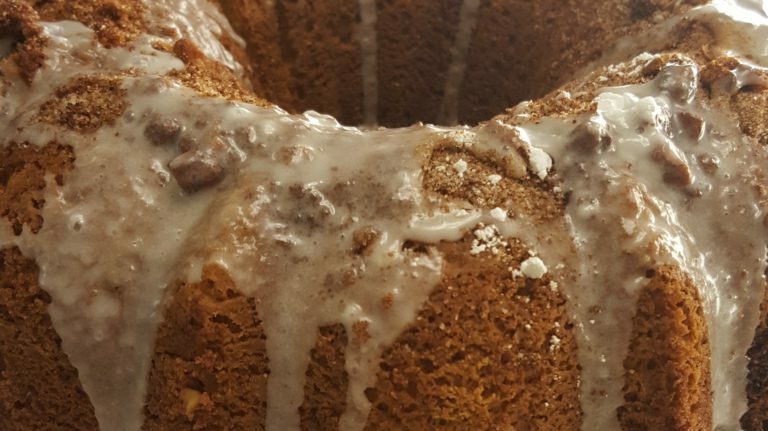 Make glaze by combining the powdered sugar, milk, and almond extract. Pour glaze over top and sides of cake. Serve warm or at room temperature. Serves 12. Cheese Tortellini in Tomato Alfredo with Broccoli and Mushrooms.